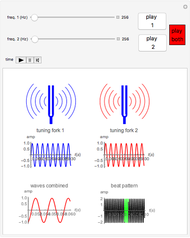 Beats are interference patterns between two sounds of slightly different frequencies. 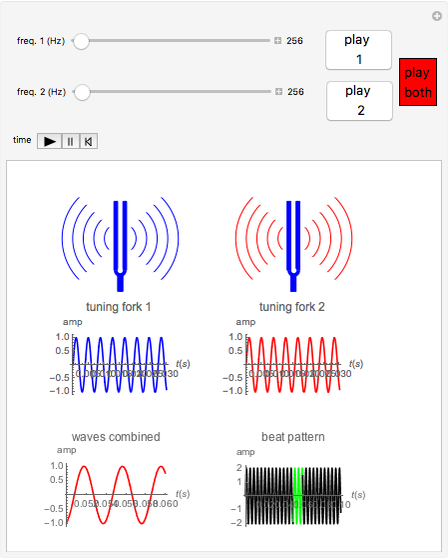 In this Demonstration, beats are produced by sound waves emitted by two tuning forks. You can vary the frequencies and listen to the sound waves. The frequency depends on the length of the tuning fork. You can propagate the waves in time using the "time" button. 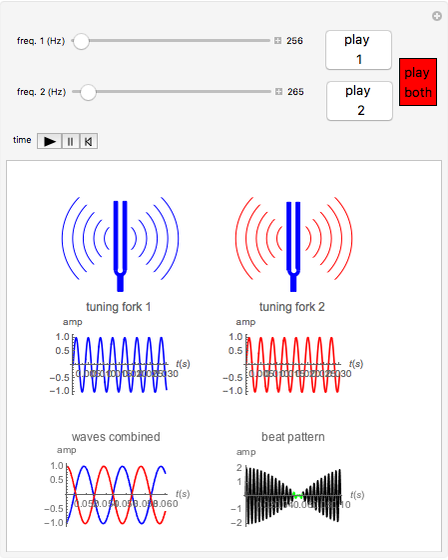 The vibrations of the tuning forks are shown under the tuning fork graphics. The plots at the bottom show the combined and summed waves (beat pattern). To show the beats, the time range is expanded; the combined wave range is shown in green in the beat pattern . F. S. Crawford Jr., Waves, New York: McGraw-Hill, 1968. The Physics Classroom. "Interferences and Beats." 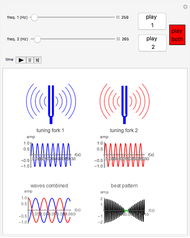 (Nov 28, 2016) www.physicsclassroom.com/class/sound/Lesson-3/Interference-and-Beats. S. Z. Lavagnino "Beats Produced by Two Tuning Forks"